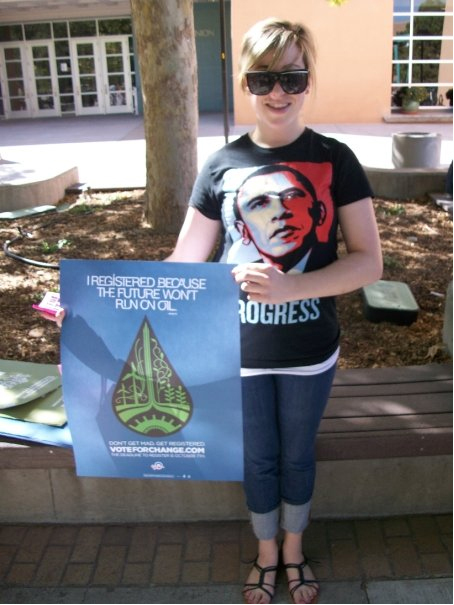 We were tasked with building a voter registration initiative aimed at young, first-time voters for Obama For America. 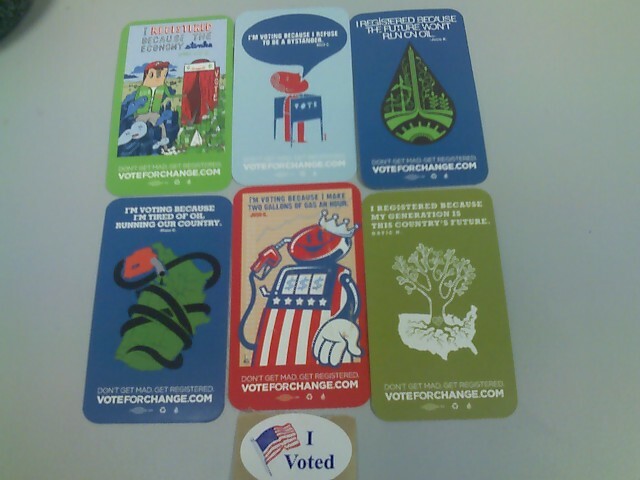 Our challenge wasn't getting people to vote for Obama in 2008, they were already leaning towards him by a wide margin. Our real problem was convincing a generation that watched George W Bush steal an election and trash the country that that voting still mattered, and registering was worth the hassle. Our answer was VoteForChange.com, a non-partison voter registration campaign that put voting in terms of one’s own personal interests. We asked hundreds of young people what they cared about, and if they were going to vote, why they were going to do so. We didn't even tell them it was for a candidate until it came time to sign releases. We launched with a video for television and cinema with young people addressing their webcams, with heavy radio support. 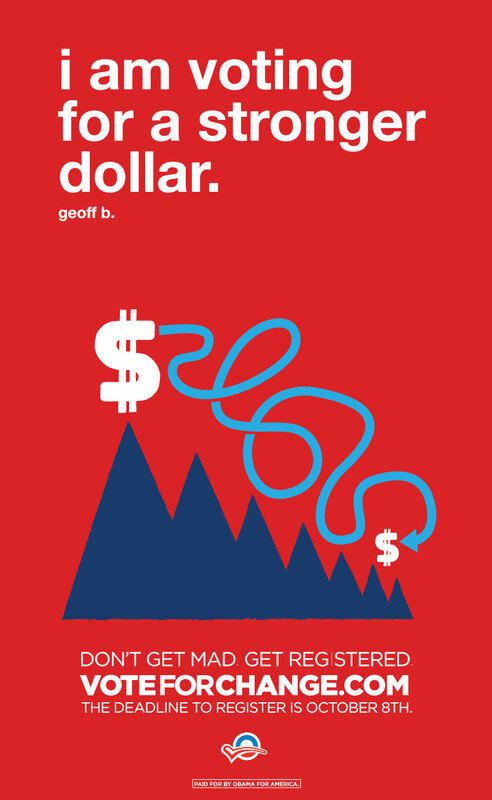 We then commissioned dozens of artists to create posters based on those reasons that would form the basis of the campaign. 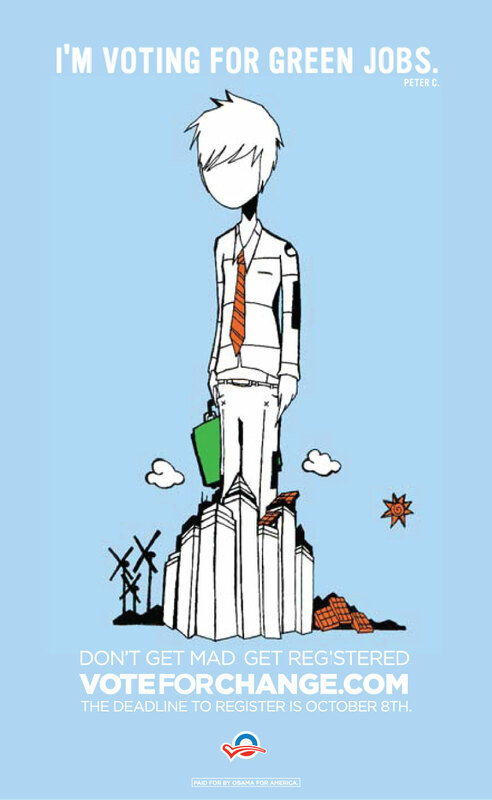 The designs were used as print ads in college and alternative papers, as well as posters, stickers and cards supplied to student organizations who acted as street teams, blanketing swing states with our message in ways no media company could. 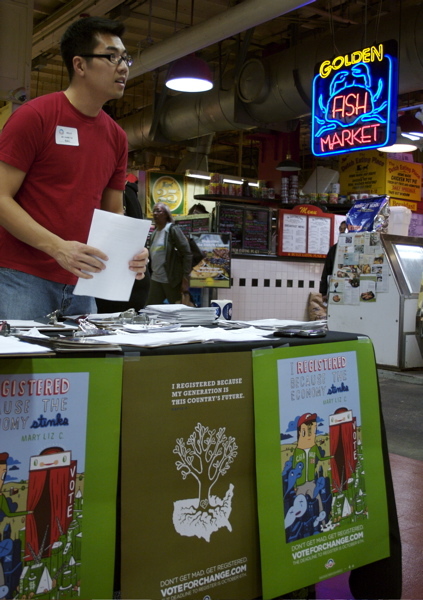 The campaign became the basis for campus and community voter registration events. College students seemed to have the most fun with the work. 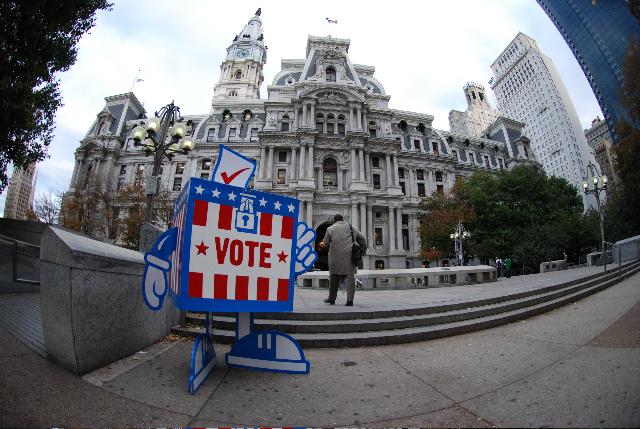 The campaign led people to VoteForChange.com, comprehensive voter registration resource where users could register to vote, check their registration and eligibility to register in strategically more important states, get information about early voting or absentee voting. The Obama branding was intentionally light, focusing on the act of voting itself as to register young people regardless of their ideology. After the voter registration deadlines had passed, we pivoted into a get out the vote effort with messaging tailored to the individual voting laws and issues relevant to each state. 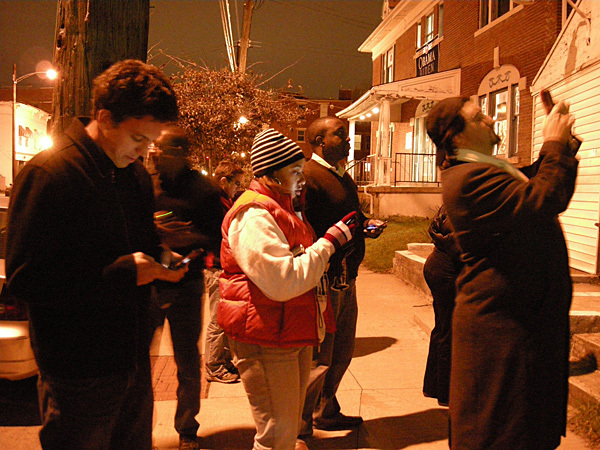 Throughout this phase, we underscored the importance of voting by highlighting the incredibly close margins in previous elections and the historic opportunity to elect Barack Obama. We even had a demo spot produced by hip-hop producer The Alchemist (Eminem, Dilated Peoples) with plans of an extended remix single with a certain famous guest rapper, but David Plouffe got cold feet and killed it. 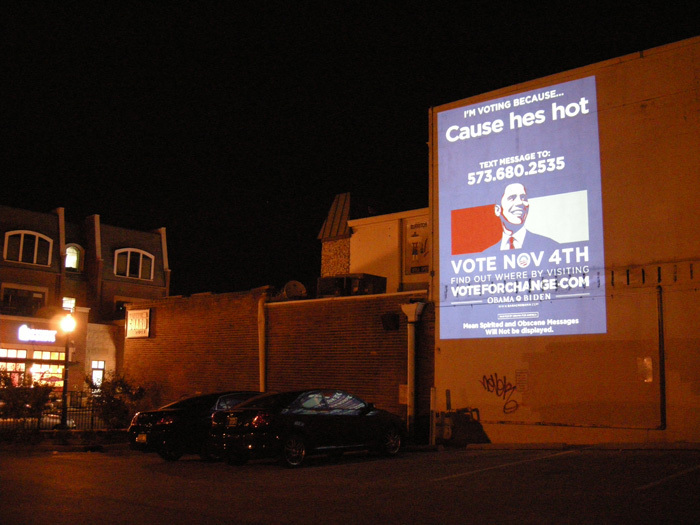 During the final weeks of the campaign, we put together a guerrilla interactive projection tour through 10 highly-contested midwest cities. 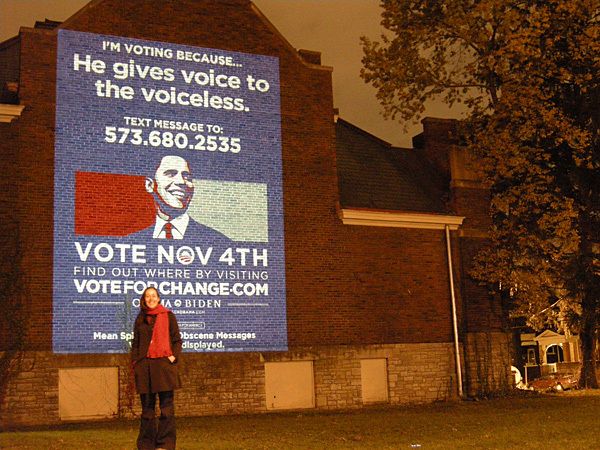 Users could text the reason they were voting for Barack Obama and have it digitally projected for everyone to see. in towns where digital billboards were still years off. 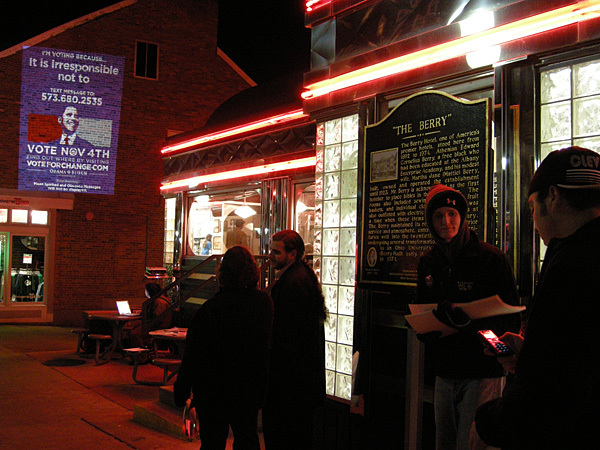 In many of these locations, this was people's first interaction with interactive projection technology. After partnering with us on the youth voter registration campaign, Tristan Eaton decided to make a get out the vote campaign of his own with some assets that weren't used in by the official campaign. 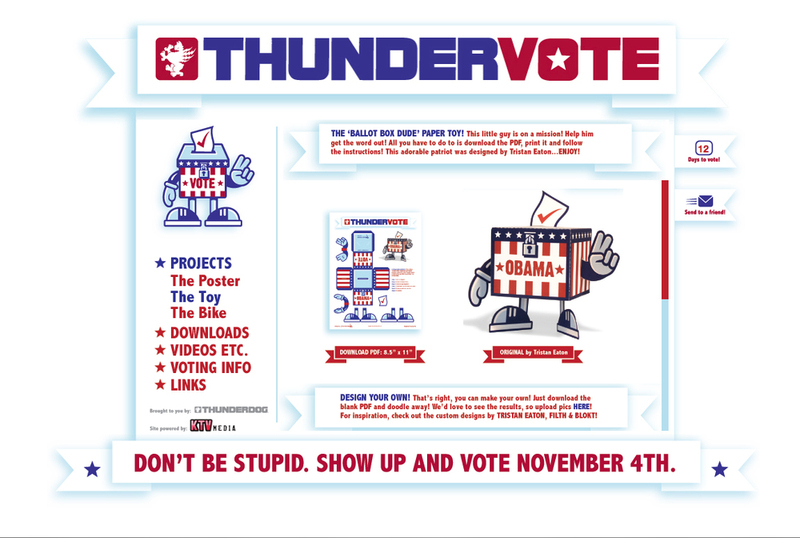 We returned the favor and helped with the messaging for his ThunderVote.com campaign. 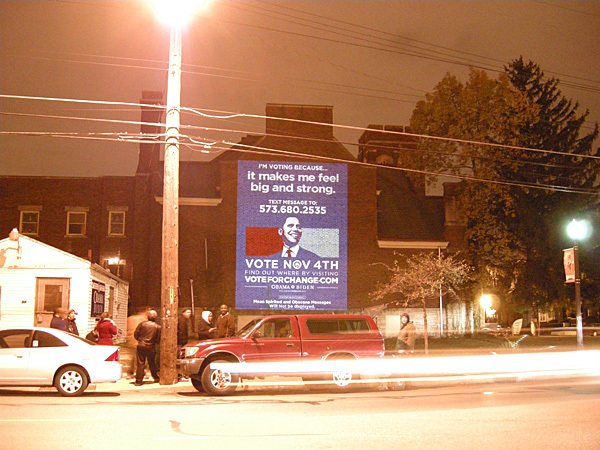 The campaign was chronicled in the book Designing Obama as a hardback and also one of the first digital books for iPad. Creatives: Daniel Bremmer, Peter Cortez, Scott Thomas. Creative Director: Marty Cooke. Partner Artists: Brian Flynn, Tristan Eaton, Max Estes, Sam Brown/Exploding Dog, Caleb Kozlowski, Cody Hudson, Graye Smith, Aaron Amaro, Melinda Beck, Jason Munn, The Decoder Ring, Aaron Meshon, Sonya Blazey, Aaron Kraten, Nicole Flores, Geoffrey Lorenzen, TesOne, Demo. Interactive Projection Software/Activation: Paul Notzold/TXTual Healing.